The P-90 pickup is one of the few guitar pickups on the market that does not include height-adjustment screws. One of the original electromagnetic pickups developed by the Gibson company in the late 1940s, the P-90 is still in use today. The P-90 is a single-coil pickup utilizing an alnico magnet, mounted directly to the guitar body with two screws through the main pickup housing ("soap bar" style) or through an extension wing on each side ("dog ear" style). The P-90 includes six external pole-adjustment screws for string sound balance, but must be shimmed from underneath to adjust height. Plug your guitar into an amplifier with a standard guitar cable and set the controls to your usual sound. Choose one of the pickups (if the guitar is fitted with more than one) and play each string individually. Listen for any string that may be stronger or weaker in sound. Turn the string-pole screw directly under the string you wish to adjust clockwise to sink the screw and lessen the string's sound, or counterclockwise to raise the screw and boost the string's sound. There is no standard level of adjustment, as sound is highly subjective. Switch to the next pickup (if fitted) and repeat Step 3. Measure the pickup height by measuring the distance from the top of the pickup housing to the strings. If one or more string poles has been adjusted upward, screw them flush with the pickup housing by turning them clockwise with a screwdriver. Estimate the height to which you wish to adjust the pickup and choose a shim that comes close to your estimate or can be modified. There is no standard for pickup height, as sound is highly subjective. Remove all strings from the guitar or loosen them sufficiently to allow room for pickup removal. Remove the pickup by turning the two mounting screws counterclockwise with a screwdriver. The screws are in the middle of the pickup housing on soap bar pickups, and on either side of the pickup on dog ear pickups. Carefully lift out the pickups and place them to the side. Cut the shim to size with scissors or a razor knife and insert them into the pickup cavity. You may use wood, cardboard, rubber, Styrofoam or foam rubber of the desired height from your measurement in Step 1. Reinstall the pickup and strings and test for sound. You may add or subtract shims until you achieve the sound you are looking for. If the result is to your liking, you may adjust the string poles if desired. Repeat Steps 1 through 7 for the other pickup if installed. Raising the pickup height will produce more output, but overtones due to magnetic interference from the strings and pickup magnet may occur. This will differ depending on the brand of pickup. Lowering the pickup will produce less output and a different tonality. Frozen desert sticks and cardboard are reliable shims that are easy to cut and measure. If using compressible shims such as soft rubber tubing or foam, you will have to estimate the level of foam compression versus height. The shim does not have to be as large as the pickup. One thin shim on either side will do. A small amount of white glue may be used to hold the shim in place during reassembly, but is not required. Perform all other guitar setup and maintenance procedures before adjusting pickups, and use new strings for best results. Adjusting the neck or bridge after pickup adjustments may affect string height, causing the adjustment to become too high or low. 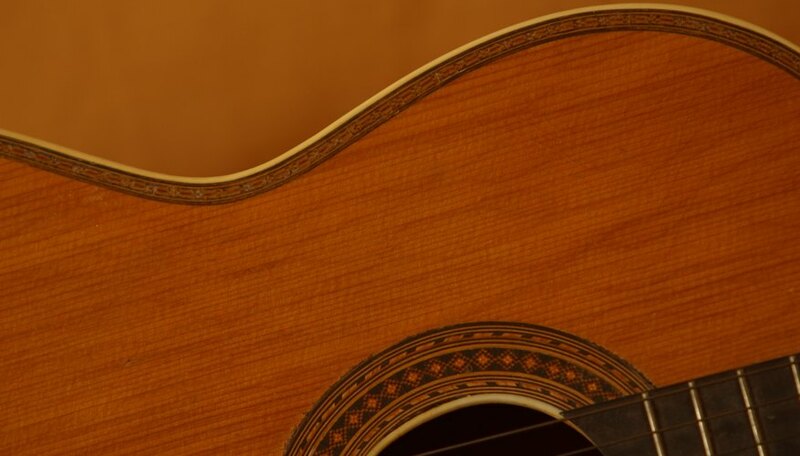 Place a cloth over the sides of the guitar when pickups are removed to prevent scratching the finish. Avoid metal shims such as washers or metal strips. Metal may interfere with the pickup's magnetic properties or cause grounding or short-circuit problems. Keep pickup wires clear of wood shims and mounting screws when reassembling. The wires may be crushed by the wood or pierced by screws, causing the pickup to cut-out intermittently or cease working.